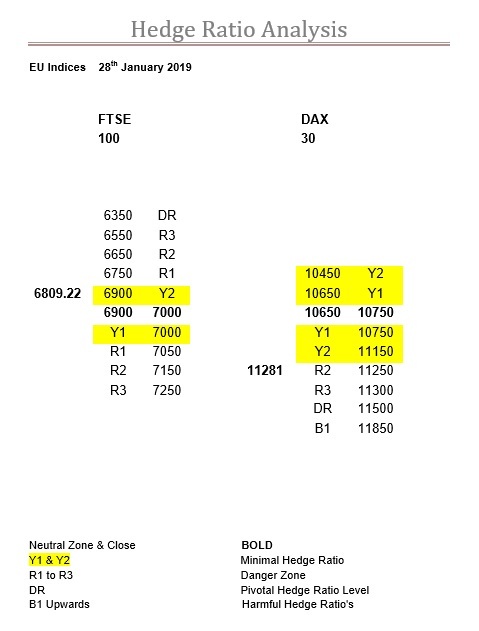 FTSE zone shift and precarious DAX, today’s Ratio Table, levels and comment. Just to remind everyone what we said last week about the FTSE; “firstly, the zone, and although it has dropped to 6750-6850 it could in fact be anywhere between where it is now and where it was last week…. So, that means, at the moment, there is precious little ratio from 6750 all the way up to 7050”. Therefore, the fact the zone today has moved to 6900-7000 should not come as too much of a surprise. Nevertheless, it is worth remembering that it was 6750-6850, as the close last Wednesday was 6842.88, and the last two intraday highs have been 6854.59 and 6858.19 on Thursday and Friday respectively. Obviously, the zone will have an impact, so it should definitely be taken note of, but the situation remains much as it was, with little or no ratio from 6750 up to 7050. The fact that the zone kept the FTSE in check last week runs slightly contrary to the high level of activity, so we can only see things getting more and more animated as this expiry progresses, and especially so now the zone has moved. Carrying on with the “what we said last time” theme, here is it for the DAX; “today, will be the decider we feel, as the proof will be how this market reacts to the R ratios at 11250, and especially at 11300, so, best also pay close attention to any opening gaps”. When we wrote this the DAX had just jumped 286.92-points to finish at 11205. The market actually gapped down at the open on the Monday and it wasn’t until Friday that it managed to get back to where it was. In the meantime, neither R2 or R3 haven’t moved, so it is going to be a definitive Monday with this index camped on the R3 doorway. Actually, it was very interesting to see how it coped with R2 at 11250, as after all that Y ratio it must have been bit of a surprise to walk into that futures selling generated by the dynamic delta. It is very aggressive, and, again, as we said, “every man and his dog” here are bullish, but make no mistake, they will now have to seriously work hard to achieve their ambitions. And, please bear in mind, if it does go sour, there is nothing but minimal Y ratio below, so it could be “calamitous” with virtually no ratio support at all underneath. R1 in SPX moves, DJX has 2 zone bandwidth tests and NDX still an ice-rink, today’s Ratio Table, levels and comment. FTSE as expected, DAX divergence, today’s Ratio Table, levels and comment.